You guys this has been my saving grace for some time now. I have horribly dry skin, but what's worse? my heals! They are cracked and callous and SO EMBARRASSING (especially during flip flop season). 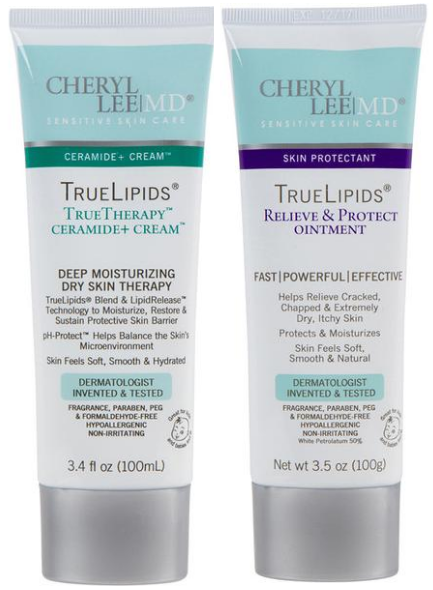 You'd be right if you assumed that I've tried TONS of creams and lotions that say they are for cracked heals, but in the end they are short lived results that don't do much but relive some pain. I have had results with this that are unlike any other! Let me just break down my ratings for you. The packaging is the only thing seriously lacking. It is to clinical for me. It looks no nicer than anything you might get at Walmart. It doesn't have any scent, what is there is pleasant and not plastic-smelling. But here's the thing, it works! It is insanely hydrating, and it penetrates DEEP, so I am not struggling to keep it moisturized. The system is two steps. 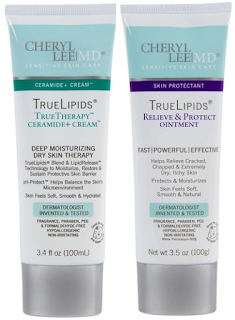 You do the Cheryl Lee MD TrueLipids Relieve & Protect Ointment first, and then the Cheryl Lee MD TrueLipids TrueTherapy™ Ceramide+ Cream. You can also use the cream as a typical hand lotion to maintain your healthy skin after it's been healed. The ointment is a thick more petroleum jelly like consistency. When you put on the ointment it goes way down deep, and then you use the cream to add a protective barrier and keep the product working hard. A little goes a long way. The ointment you don't have to use forever. I used it twice a day for 4 days, and then once a day (at night) for an additional 3 days and my feet were back to normal! ONE WEEK! Can you believe that!? Now I use it once every two weeks, or whenever I notice my heel starting to get a little dry. The same bottle has last me over a year now. The cream I try to use daily, but I am honestly not good about it. I use it whenever I use the ointment, and maybe once a week outside of that. But that's the best part! You don't become a slave to a new thing to add to your daily routine. I am seriously obsessed. ***I do not get any kickbacks or discounts for product ordered through these links.